The Rebecca Foundation has received GH¢ 100,000 support from Greenhouse International Development Ghana Limited, a Chinese group. 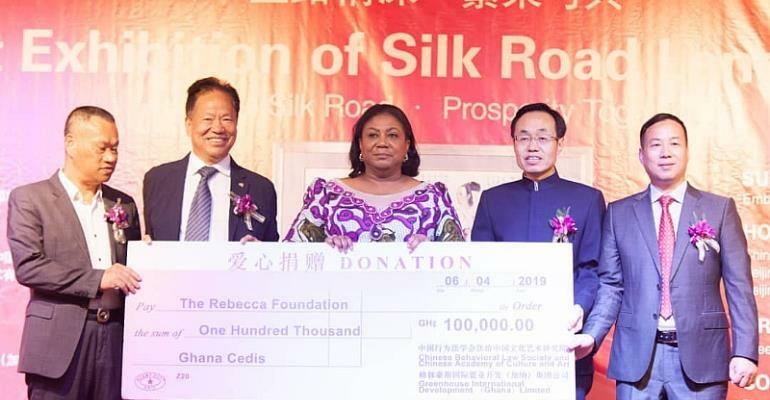 The donation was made on Saturday, April 6 at the launch of the 2019 Silk Road Language & Art Exhibition at the Confucius Institute, University of Ghana (UG). It was made possible through the sale of paintings of six Chinese artists from the Chinese Behavioural Law Society. A total of GH¢180,000 was realised from the sale of the paintings, with the remaining GH¢ 80,000 expected to go into other benevolent projects in Ghana. The Silk Road Language & Art Exhibition seeks to promote cultural exchange between Ghana and China. Ghana happens to be one of the first countries in Africa where the Silk Road Language & Art Exhibition is taking place. Mrs Akufo-Addo, who received the donation on behalf of her foundation after helping to present certificates to the artists, thanked the society for the kind gesture.